Let's see what kind of electromagnet we need for our SEM fusor design. B = 1 T, l = 1 m, N = 1000 -> I = 1 . 1 / (2.10-7 .1000) = 5000 A , very high..
Electromagnets are usually in the form of iron core solenoids, see hyperphysics . The internal magnetic domains line up and multiplicate the field by factors to even thousands. I think it would be better to place an electromagnet with an inner core, on top of the fusor and under the fusor (or if we turn it 90 º, at the sides). Using a couple of permanents magnets? A small disk of 10 cm diameter and 1 cm thickness has at 1mm distance B= 1,4 tesla, but at 10 cm distance B=1,9 gauss, and at 30 cm B=0,1 gauss. If our SEM fusor had a diameter of 20 cm and a length of 0,5 m, the circumference would be 62 cm. We could place 60 of this small magnets in a ring around. The magnet field in the middle would be 60 gauss; not enough. The price of one such small disk is about 20 $. 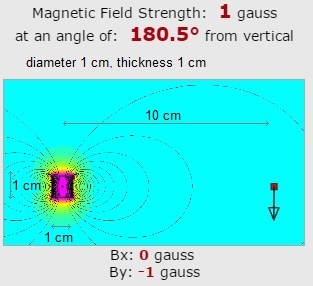 ( kjmagnetics.com ). One ring would cost 1200 $. 50 rings... far to expensive.. Not an option. (Consider the SEM fusor with a diameter of 45 cm and a length of 100 cm. We make small electromagnets winding copper wire around a iron bold. Price of iron about 1 till 3 € / kilo? The iron core causes an increase of the magnetic field inside the coil of about a 1000 times. 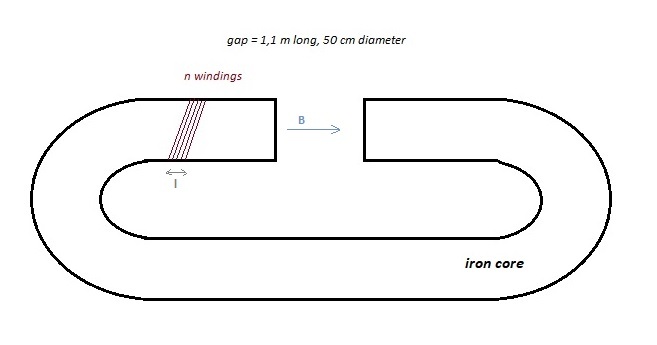 The length of the iron core is not so important. Let's assume the voltage is 12 dc, and we have 1000 turns. Then the current must be 880 A and the power 880*12 = 10,6 kW (about 11 electrical heaters). According Engineeringtoolbox.com the maximum current of such a cable is about 20 A. -> 8,8.105 = N. 20 -> N = 44000 turns. 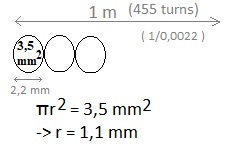 diameter of a turn = 60 cm -> circumference = 2π.0,3 = 1,89 m -> total length = 44000 . 1,89 m = 83 103 m - > price = 18000 € .. If we take into account the insulation material around the cable (thickness of it is aproximated) and suppose the area of the cross section is then 3,5 mm2, then we can make over 1 meter length 1 layer with 455 turns. To get 44000 turns, we need about 100 layers. The thickness of all layers would be around: 22 cm.